Italian women walk a lot, especially in the cities. This means they need to be comfortable, but they never forget the style. 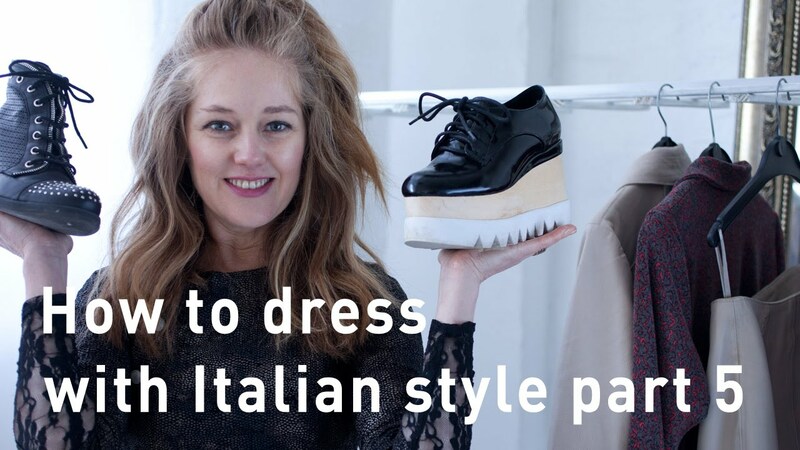 In this video I am going to show you how to wear comfortable shoes with Italian style. I was amazed to see that Italian women are actually quite short. In fact… I was tall there… I loved that. I noticed how much you have to walk if you live in an Italian city. There is no time to go hobbling around in stilettos. Well, the Italian women know how to do this with style. 1. Choose stylish flats. Wearing flats doesn’t mean you have to look dowdy, quite the contrary. In fact, around the world, flat shoes are outselling high heels. The higher demand for flat shoes, means designers are having to get creative and provide what the modern woman wants. These boots are a great example. I did get in Italy, but look around for shoes or boots that have just a touch of a heel for support, but not too high. Then wear them with confidence! Often we think we need a heel to feel confident. Not anymore. 2. Look out for flatforms. This is the latest trend. Here you can have extra height and comfort. Make sure the shoe has some tilt. This makes them easy to walk in and balance in. Flat flat flatforms can make you feel like you are stomping around on stilts.